Robilliard & Son Quick Service Petrol Station. Homepage. This page: An old receipt for Shell motor fuel purchased in March 1961. G.A. Robilliard & Son Ltd, petrol station. 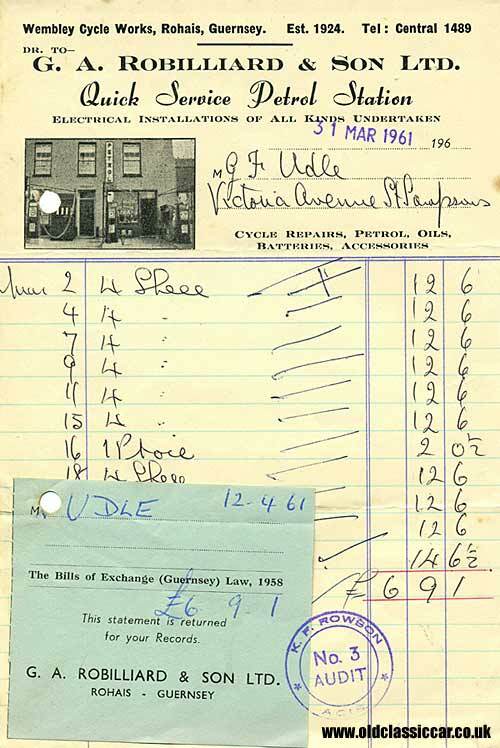 This invoice was issued in 1961 by a tiny kerbside petrol station in Guernsey, trading under the name of G.A. Robilliard & Son Ltd. Mr Udle, of Victoria Avenue in St. Sampsons, must have been a regular visitor to this petrol retailer, as it seems he bought four gallons of Shell motor fuel every few days or so. Robilliard & Son looks like a classic example of a small business, specialising in cycles and domestic electricals, that grew to accomodate the motor-car owners in the area, by serving petrol from various kerbside pumps. Three pumps are visible here, with swing-out booms that enabled the pump attendant to fuel up the cars as they stopped at the kerb. A large oil cabinet is also visible to the left. The business address was the Wembley Cycle Works, Rohais, Guernsey, and the heading on the invoice shows that they started out in business in 1924. If anyone recognises the buildings shown here, and has any later photographs showing them as they are today, it'd be interesting to see them please. 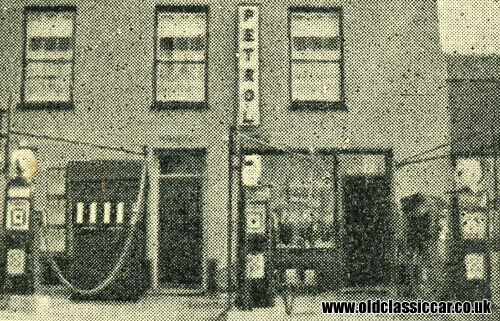 And if anyone remembers being served at this small "Quick Service Petrol Station" it'd be great to hear from you. Martin, who lives on Guernsey, contacted me, with an updated view of how the former Robilliard building looks today. Martin also adds: "Yes I remember this petrol station very well. We used to fill up my dad's car there when I was a small boy. It was running until well into the 1970's before health & safety madness made it close down because it was too close to the road - the pumps were literally on the pavement! 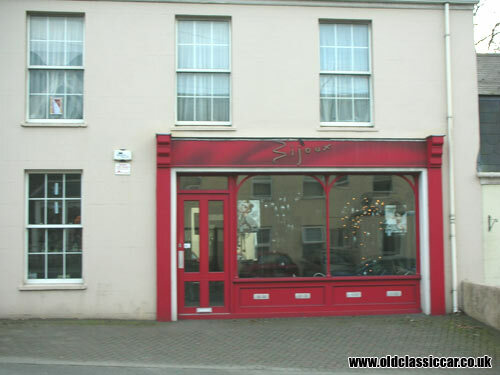 The premises are now a hairdressing salon called Bijoux. There were two such petrol stations only yards apart on The Rohais - both opposite the ambulance station which is still there. The second petrol station is now a ceramic tile showroom. Like many such places both here and no doubt on the mainland, they have closed to make way for larger purpose built forecourt places with shops, but no personal service unlike Robilliards and many others I remember as a boy". Thanks for the update! I've also added in two illustrated billheads/invoices for motor companies based on Guernsey in the 1920s & 1930s - visit the Le Lacheur's Garage and Vale Avenue Motor Works pages to read about them.